Deep nourish formula, for different kinds of hair, nourish and bleach hair at the same time. 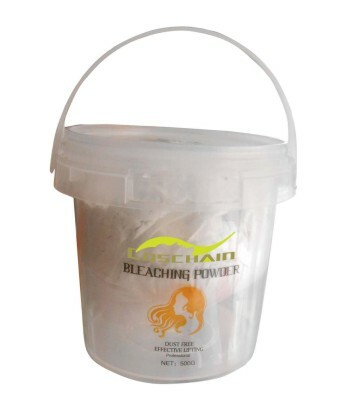 The dust-free formulation takes a healthy bleaching. Outstanding Lifting ability, can even bleach artificial black color. Competitive price for supreme quality, dare to compare with top brands in the professional market. DIRECTIONS: Mix dust free bleaching powder with peroxide at the weight ratio of 1:2. Mix evenly and applied to the hair, observe the bleaching result carefully by professional hairstylist. When the desired result reaches, rinse out with water. Heat may be applied to speed up the processing time. For external use only. The product must not be used for dyeing the eyelashes or eyebrows. Avoid contact with eyes. If so, rinse out with lukewarm water immediately. Keep out of the reach of children.